The Chelsea Flower show is fast approaching and plant preparations have been under way for quite some time now. If only the show was in July, my job would be made a lot easier. Forcing summer-grown fruit and vegetables to be at their best in mid May can be a little bit touch and go, but despite the chilly temperatures over the last couple of weeks my container-grown plants are looking good. There was one particularly warm day when I decided that the potato patio planters should venture out of the Sunbubble as I was worried that they might be growing too fast. I then forgot to put them back under cover on the very evening that one of those cheeky late Spring frosts decided to descend. It was extremely lucky that I woke up at midnight, realised the peril the potatoes were in, and rushed out in my pyjamas to put them to bed. There was a little bit of frost damage to some of the leaves, and I got cold, wet feet, but both quickly recovered. The container-grown strawberries are in flower and some small green fruits are appearing. I am very much hoping for some warmer weather to ripen them to a rosy hue in time for the show. The Vigoroot grown plants are looking fabulously green and healthy and ready to grace the stage on our Haxnicks stand at Chelsea. Other seeds for success were sown this time last year. Those were the seeds of an idea to develop a new product that would combine the magic of our hugely successful Vigoroot™ fabric with a simple self-watering system. From this idea grew The Vigoroot Easy Table Garden. This exciting new product is a raised table garden, greenhouse and irrigation system all rolled into one. The RHS are excited about it too as it has been nominated for the Chelsea New product of the Year finals…watch this space!! This entry was posted in Grandpa Haxnicks and tagged Potato Patio Planters, Vigoroot, Vigoroot fabric, Strawberry and Herb Patio Planters, Vigoroot easy table garden on 10th May, 2017 by Potty Gardener. Surely it’s too early to be thinking about Christmas, I hear you say. At least I think I do, amongst the many other voices in my head. I am indeed thinking about Christmas. More specifically I am thinking about potatoes at Christmas. Even more specifically, delicious hom e-grown roast potatoes at Christmas being proudly placed on the table to gasps of awe and admiration and maybe a harmonious chorus of Gloria! Normally, British potatoes are home-grown from early spring throughout the summer. Instead I am planning to sow some spuds now in Potato Planters, nurture them through the autumn and hopefully harvest them in time to share oven space with whatever beast we decide to roast for Christmas lunch this year. At this time of year, cold-stored potato tubers should available from specialist seed merchants. 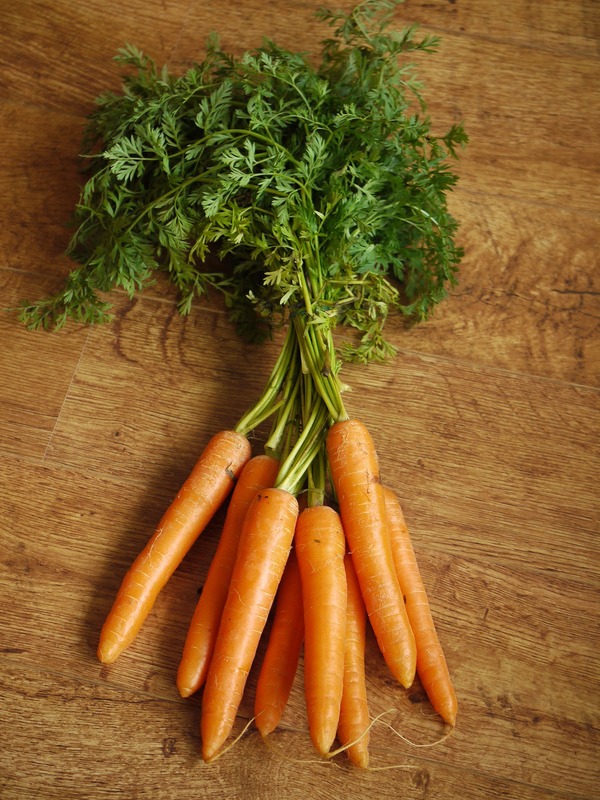 Maris Peer or Nicola are good winter varieties that don’t need chitting. Having said that the ones that I have just picked up from my local Garden Centre are vigorously chitting. Looks like they are chomping at the bit. So we will see if this makes a difference. I have had varying success in the past just using supermarket spuds. Grandpa Haxnicks tells me that this is because harvested potatoes go into a dormant state for some months before they are ready to produce new shoots. So, either I found particularly stress resistant tubers in the supermarket. Or they had been on the shelf for a long time and were very ready to get out and breed! 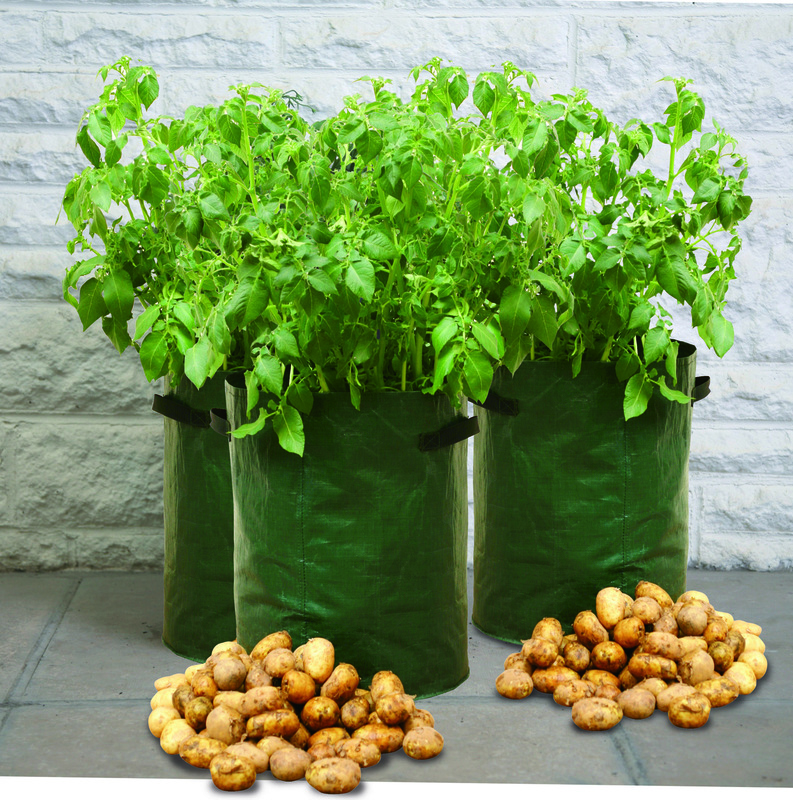 Plant your eager-to-breed tubers in the potato bags. Plant on about 6 inches of multi- purpose compost and cover with the same amount again. Each time the foliage pushes through the soil, cover it again until the bag is full. Keep them watered and fed with a liquid fertiliser. The Bage can be kept in a greenhouse, but should also be OK outside provided they are given frost protection. A cosy Fleece Jacket should do the trick, no need to bother with a scarf or gloves. In the autumn, when the foliage yellows and dies back you can cut it off. then leave the potatoes in fairly dry soil until Christmas. Once harvested, be reassured that they will then enter their dormant state and wil be perfect for peeling and roasting. 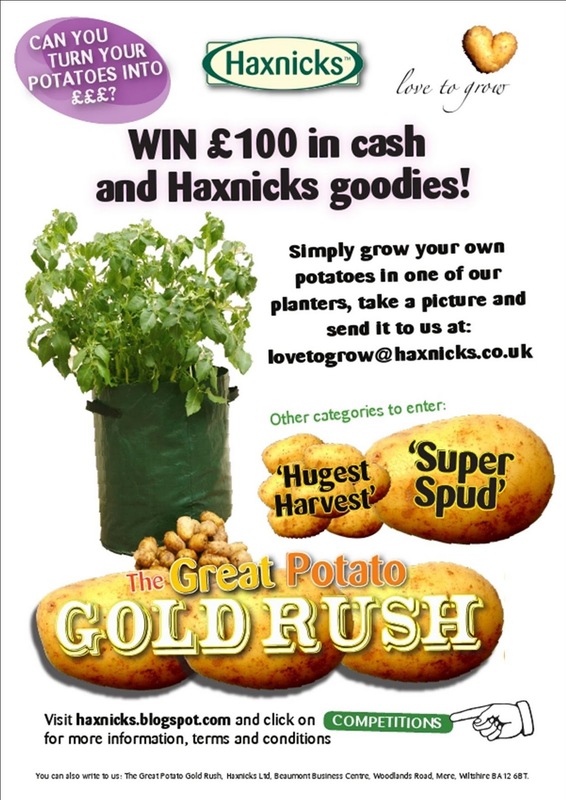 This entry was posted in Potty Gardener and tagged Haxnicks Potato Patio Planters, Potato Patio Planters, Easy Fleece Jackets, potatoes, spuds, maris peer, charlotte, Christmas, xmas, roasties, Potato planters, container, Container grown on 2nd August, 2016 by Potty Gardener. This week I decided that my well-travelled potted veg garden had given its all and was ready to be put to bed for the winter. The pots and planters have had an exciting year travelling from greenhouse to garden, from the Cotswolds to Chelsea and finally settling in their new spot on top of a windy hill in Dorset. My final colourful crop was a healthy collection of oddly sized, strange coloured veg that nevertheless gave me a grin of self-satisfaction and made me wonder a few things…. Q Are the satisfied smiles of celebrity gardeners that glare out of my gardening magazines perhaps true grow-your-own grins rather than I-can-charge-an-enormous-fee faces? Q Can I call my giant courgette a marrow? A I can if I want to. Marrows and courgettes are both members of the squash family (cucurbit) with just a few horticultural differences. Strictly speaking, according to my research, if you want to grow marrows you should choose a thicker skinned variety of courgette designed to grow big and make sure that you are happy to spend most of autumn making chutney! Q Can I ripen the last few green tomatoes without the Indian summer that I was expecting? A Yes with a banana! Put the green toms in a box or jar with a ripe banana and it will release its magic ripening gas to turn your tomatoes red. Wouldn't we all go red if we were trapped in a confined place with a banana? Q What can I do with the seemingly useful looking soil that I have emptied from the planters? A The soil will have lost its magic, drained of goodness and gusto for growth. As with crop rotation in veg plots you don’t want to be growing the same sort of veg again in the same soil risking pests and diseases that would turn your grow-your-own grin into a grimace. Put the soil on the compost heap or spread it on borders, but beware of the escaped potato from your potato planter soil. There will be at least one and it will pop up in your flower bed next year totally unaware how out of place it looks. This entry was posted in Potty Gardener and tagged Carrot Patio Planter, Potato Patio Planters, Tomato Patio Planters on 20th September, 2015 by Potty Gardener. Hello from The Potty Gardener! There is definitely an air of spring on its way this morning. No sign of a frost, some chirpy birdsong and a glimpse of sunshine. Of course, it won’t last but it is fuelling enthusiasm for my new project. The kitchen table is strewn with gardening magazines awash with smiley, rosy cheeked experts inviting me to join in their plant-based passions. 'Sow', 'Create', 'Transform', 'Cultivate', 'Titivate', 'Rotavate', 'Motivate'! Further fuelling of enthusiasm for my new project. So what is my new project, I hear you ask (or is that just the voices in my head?)? Well I'm quite happy talking to myself…potty, completely potty….and that is my new project. The potty garden. This year I am going to grow everything in pots, planters and bags. Why (voices in my head again)? Not because I am potty, but because I am living in a rented property where every inch of growing space is a knotted nightmare of ground elder roots. It invades the dry stone walls, penetrates the weed matting and is resistant to roundup. But it is possible to be motivated to sow, create, cultivate, titivate (maybe not rotavate) without the garden. I am making a plan that starts with potatoes in planters, but that ultimately helps me to get growing and glowing like they do in the magazines. I want my pink cheeks to match the flowers in my garden like Carol Klein, to use my hands as spades like Monty Don and develop an organic grin as satisfied as Bob Flowerdew, so watch this space! 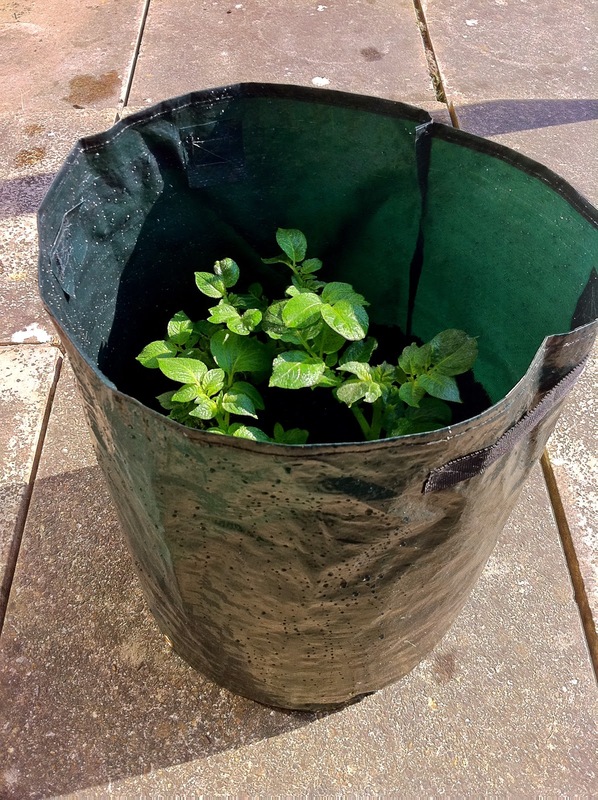 This entry was posted in Potty Gardener and tagged Potato Patio Planters, The Potty Gardener on 27th January, 2015 by Potty Gardener. This entry was posted in Grandpa Haxnicks and tagged Potato Patio Planters, Vegetable Patio Planters, Vegetable Sack on 6th February, 2013 by Haxnicks.